A new granny dress for a New Granny! Its been a tough week for my daughter who was due to have her new baby on 2 July. 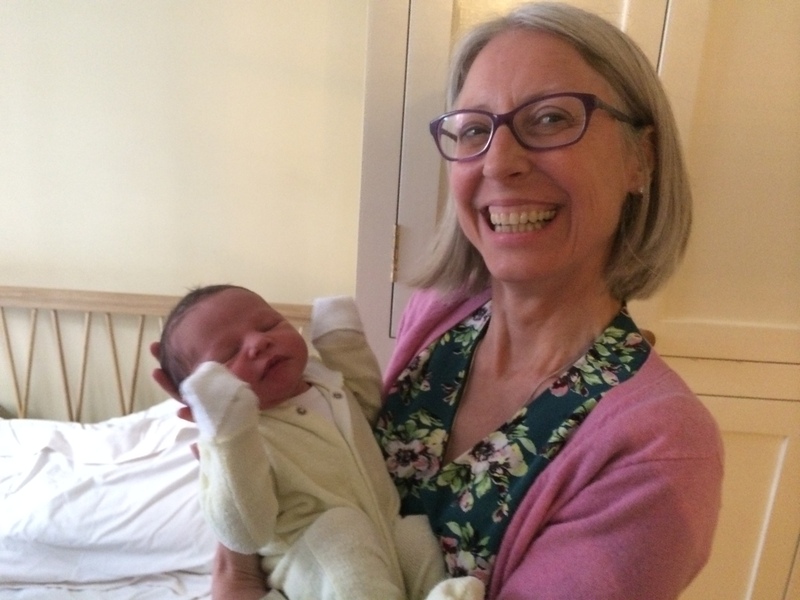 I was expecting a call every night from the end of June and I am delighted to tell you the baby arrived safely yesterday – 12 July. While waiting I ran up a couple of frocks. The first was for Esme to wear to the wedding yesterday of her best friends Gemma and Bren. 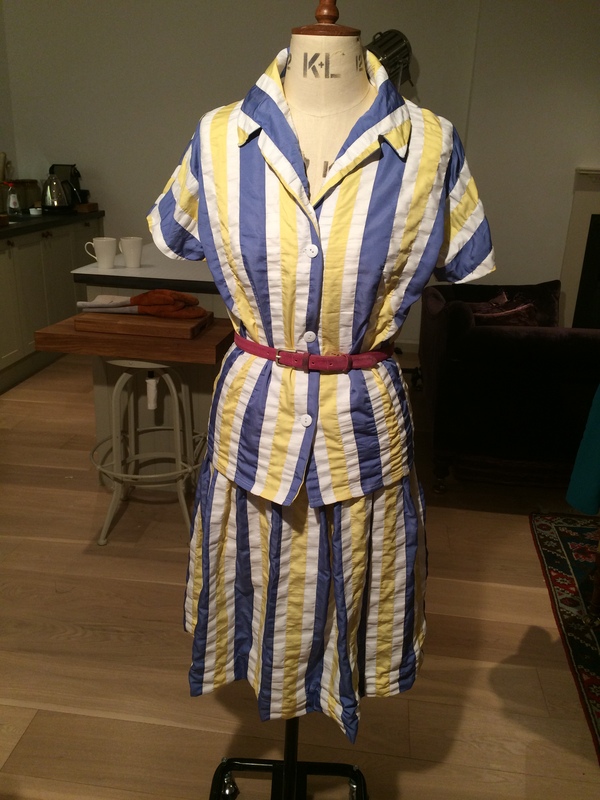 She wanted a retro 50s look, with buttons at the front for easy baby feeding, and chose some yellow, blue and white striped fabric. Its a bit like seersucker and it was not an easy sew. I had to avoid steam as it puckered when ironed, and I expect it may behave strangely when washed. Esme expected to attend the ceremony with her new born tucked in a sling. She asked me to make a suitable dress, which was quite a tall order. At no other time would a woman’s waist go down from something like 40″ to 25″ over a few days, while the bust measurement might go from say 32″ to 36″. I went on Artisan’s Square to ask for help. I used a tried and tested blouse pattern (size 12) I had used for my SWAP, Vogue 5569. It has a kimono sleeve which means I can take it in from just the side-and-sleeve seam. For the skirt I dithered about pleats and zips and panels, and in the end decided on elastication. I left the safety pin in the elastic so that it could be tightened to fit. It is fairly full and I plan to turn it into a pleated skirt with a waist band once her body returns to normal. I figured she could wear a belt or tuck it in or wear it loose, or even wear the blouse over a T shirt, as a jacket. Instead of going to the wedding Esme woke up feeling really down as the midwives had booked her in for an induction tomorrow morning (Monday). She knew she couldn’t travel to Nottingham for a wedding at “41+3″( as it says in her notes). I suggested a nice lunch out and we met at the beautiful Skylon restaurant on the Southbank and had a splendid meal. Esme was in the early stages of labour and having a few uneven contractions thoroughout our three courses, tea and petit fours. The sommelier gave her odd looks as she went a bit vacant and started puffing from time to time. Anyway it was all very manageable and we spent a couple of hours taking, eating (boy – has she got an appetite!) and laughing hilariously at Tommy Cooper jokes. We went for a walk around the “Love Festival” (how appropriate!) in the glorious sunshine, she pausing from time to time to have a contraction. At around 4pm we decided to walk home as she did not fancy taking the bus. As we navigated the Waterloo area her contractions got more serious and she held on to me or grabbed some street furniture and swayed during each one. I realised we needed to get her home asap, so I left her propped up by a pub while I tried to find a taxi. Luckily a passerby asked if he could help, and by standing in the middle of the road he managed to flag one down. What a relief! We were driven home carefully by a cabbie who claimed he “had seen it all before”. Esme more or less crawled out of the cab to her front door and prepared to give birth on the floor of the sitting room, with Shane in attendance. The community midwives arrived, and 90 minutes later the baby arrived too. 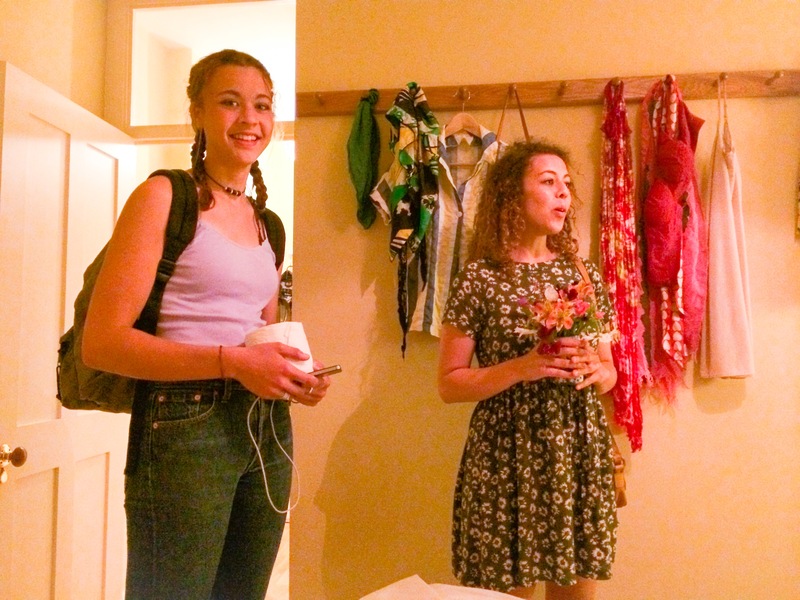 Esme’s step-sisters Lily and Rosa turned up with flowers from the garden and you can see the unworn wedding outfit on the peg rail. The other dress I made this week was for me. My concentration levels being somewhat lacking I chose a pattern described as “FAST and EASY”. I sent a picture to Esme wishing her a “FAST and EASY” labour (and so, thank God, it was). 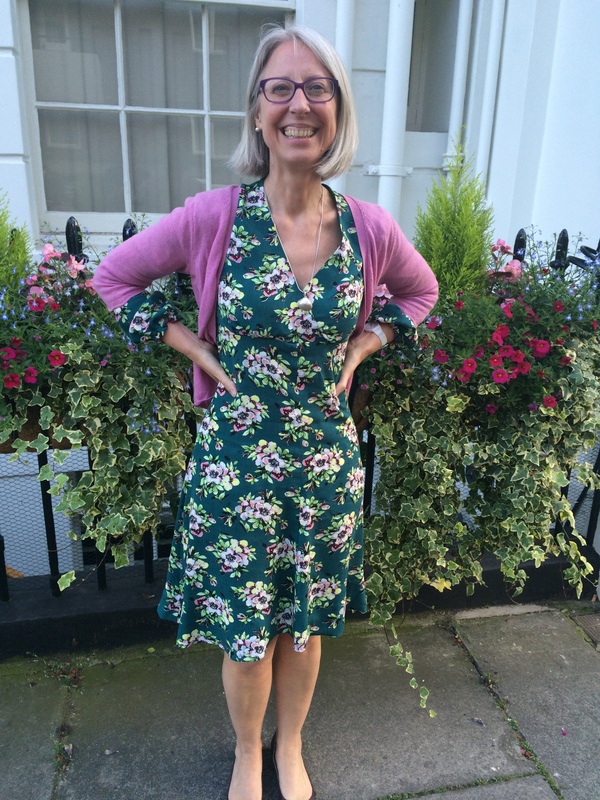 The fabric I chose was a remnant from Simply Fabrics – it’s a viscose crepe with a retro pattern. 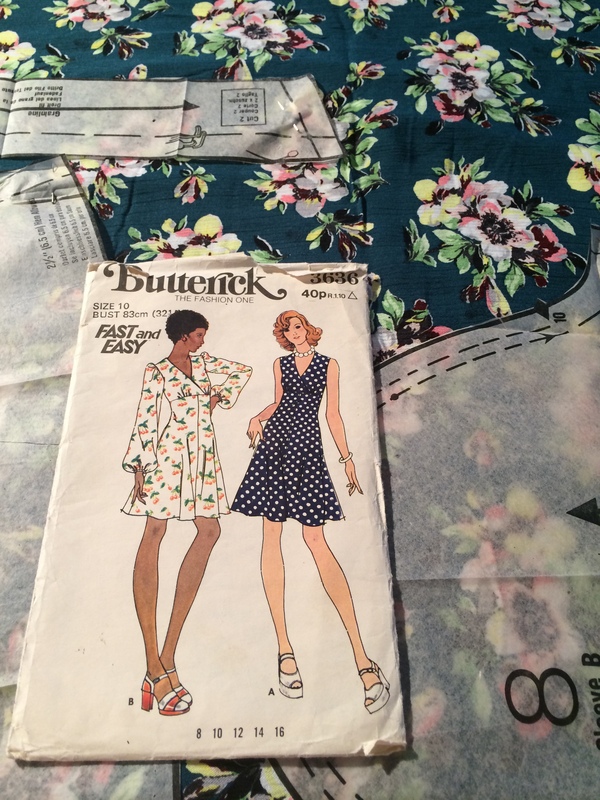 Although my pattern was a size 10 (b32) I measured the pieces and concluded it had adequate ease to fit me. I made the torso an inch longer and did not adjust the length. This look sums up the 1970s for me, especially the 70s doing the 40s. 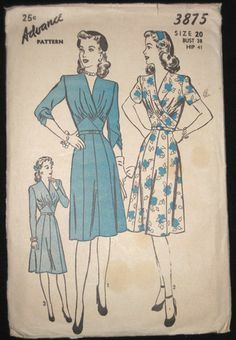 Here are some typical 1940s dress making patterns. Generally a very flattering look for the average woman. Some emphasis on the shoulders to balance out the hips and on the waist, often belted. Fitted around the rib cage making the torso appear lithe, aided by the wrapped look, a V-neck and the flared skirt. This look was rejected in the 50s and 60s, but rediscovered in the 1970s. 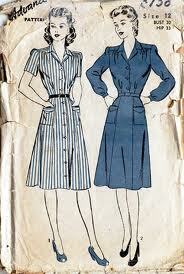 Most women will look good in the designs of the 1940s and 1970s, in my opinion. This was indeed a nice, fast and easy make. I lined the bodice rather than use the facings, and probably should have lined the skirt too. The fabric I chose had a medium sized floral motif which, in an ideal world I would have matched. I didn’t have enough fabric and I didn’t have the time, and I am happy with the look. The sleeves are gathered bell sleeves, known as Bishop sleeves for obvious reasons. The suggested method was to use bias binding to create the channel for the elastic, which I did. It’s nice and easy to wear, so I may make the sleeveless version too. My new grandbaby – less than 24 hours old! What a wonderful granny (even though that dress isn’t granny-like at all) and cute baby! Such an exciting story! Your new grandbaby is beautiful, and the frocks look just right for their occasions. Hurrah for the new grandbaby!! You must be so proud (and relieved…) and what an exciting time for the entire family. Love your new dress. The colours are very July and suit you perfectly but then again, you knew that! Congratulation to new granny Kate, and new mum Esme! Love both dresses. Think dress 1 would suit Esme well in terms of colour, and especially its versatility. Would be good to see how it fits on her. Like dress 2 and the pink cardigan on you: chic! chic! chic! I love happy endings! Sounds like quite the day. I love the dress you made too–it is so flattering, as you say. I wish there were more dresses like this in stores. Perhaps you should be starting a new business!! Congratulations on your new grandbaby! And what a lovely floral dress!